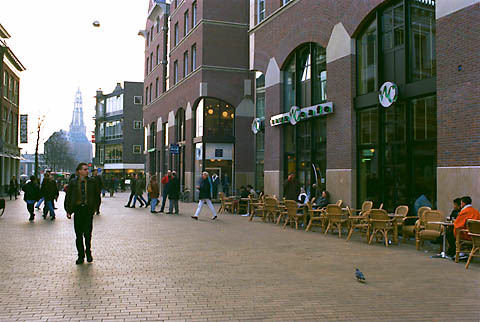 Part of the large nearly carfree center. The conversion of existing cities to the carfree model is a difficult issue. While this would certainly be possible if extensive demolition work were feasible, it is not reasonable to assume that cities will simply be able to demolish the entire built environment and begin again. This raises the matter of how existing cities can gradually be converted to carfree cities. Presented on 30 October 1997 in Lyon. The concept plan above was presented during the public day of the 1997 "Towards Car-Free Cities" conference in Lyon, France. It maintains existing metro lines (black halts) and adds quite a number of new lines (red halts). The concept was developed with little knowledge of local conditions and certainly could not be built as depicted. This plan does, however, give an idea of what a conversion of an existing city might look like. It is worth noting that the 35-minutes-to-anywhere standard is not reached with this plan, but quite fast transport is still possible. Some trips do require two transfers. Incidentally, the newest of the four metro lines in Lyon operates fully automatically - there are no crew members on the train. This conference produced the "Lyon Protocol" for converting large districts to carfree areas. It defines a strategy for reaching consensus on how to design and implement such a radical change.